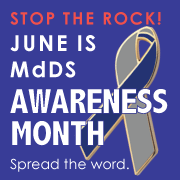 June is MdDS Awareness Month, so the Foundation and its volunteers have been working doubly hard to spread awareness of Mal de Débarquement Syndrome. Our rare disorder with the strange French name is now recognized by organizations such as the NIH, NORD and, just recently, the Rare Disease United Foundation. But we need to work even harder so that the general public recognizes it, too. We’ve been posting daily on Twitter and Facebook to reach as wide an audience as possible. If you’ve missed our daily updates, you can catch up by clicking on either icon below. See our daily posts on Facebook. Catch up on our daily #mddsJAM Tweets. To ensure you don’t miss out on future updates, be sure to like our Facebook Page and to Follow us on Twitter. Please help us make this June our best Awareness Month ever. Sharing and reposting to your social networks can help make that happen. Thank you.